Moxy's got a lot of "moxy". She's a real get up and go Ugly with far more energy than her older brother OX. Moxy's favorite activity seems to be bouncing off the walls and jumping in and out of mischief. Her giant antennas are always on the look out for a good time and she can hear a party from miles away. She could hear you coming from all the way back over there! Are you a party animal? No? Would you like to take care of one? No? Well that's ok because Moxy is here to take care of you. She can take care of pretty much any problem you may have...it's a gift of hers. For example see how messy your room is? No problem! See? Moxy is on your side. Sun-Min sewed Wage into a plush doll and sent him to David as a surprise gift. David asked Sun-Min to sew a couple more for the Giant Robot store in Los Angeles and they sold out in one day! A very excited Sun-Min sewed many more and those sold just as fast! Sun-Min and David then began to pull more characters from the Uglyverse a universe where UGLY meant unique and special to translate into plush Uglydolls. They both met again at their very first Uglydoll Toy Fair booth (a small 6x6 booth made of felt and wood) in New York where they would go on to win Toy Of The Year 4 years later! 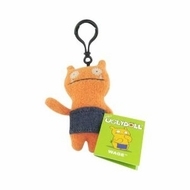 UglyDoll can be hung anywhere!